"Marked by Moonlight is a thoroughly tantalizing tale! Sharie Kohler knows how to deliver a riveting plot, steeped with sultry sexual tension and unforgettable love scenes between an irresistible hero and heroine-outstanding paranormal romance." This site last updated October 2018. Welcome to my website. Thanks for stopping by. I hope you will check back often to see the updates and learn all about my exciting paranormal series: The Moon Chasers. Each book in the series can be read as a stand-alone, but it’s always fun to read in order! NIGHT FALLS ON THE WICKED marks my fifth book in the series. Book #6, A SOUL SO WICKED, will be Darius’s and Tresa’s book! At last!! I know many readers will be thrilled that Darius is finally getting his own book. You may already know that I also write historical romance and young adult paranormal romance under the pen name, Sophie Jordan. Please feel free to visit those sites and learn more about those books … especially which book has attracted the attention of Hollywood! Want to hear Sharie talk about her Moon Chasers series and what readers have to look forward to? Check it out! Great news, e-readers! ORIGINS book bundle is available at your favorite e-book store! 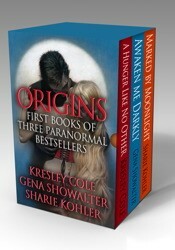 ORIGINS includes the first book (MARKED BY MOONLIGHT) of Sharie’s paranormal series, plus the first books in Kresley Cole's and Gena Showalter's paranormal series. Don’t miss out! Don't miss the Moon Chasers Trailer below! Click the arrow button to play video.